When faced with a challenge or problem, one of the best first steps in solving – even before you start thinking up possible solutions – is to examine and restate the problem. Below I’ve provided eleven different methods to help restate a problem. The first five are found in Jones’ Thinker’s Toolkit. Restate the problem using different words without losing the original meaning. Initial statement: How can we limit congestion on the roads? Paraphrase: How can we keep road congestion from growing? Turn the problem on its head. Initial statement: How can we get employees to come to the company picnic? 180-Degrees: How can we discourage employees from attending the picnic? Jones points out that taking the opposite view of a problem is a surprisingly effective technique. Restate the problem in a larger context. Initial statement: Should I change jobs? Broaden focus: How can I achieve job security? Boldly, consciously change the focus. Initial statement: How can we boost sales? Redirect focus: How can we cut costs? Ask “why” of the initial problem statement. Then formulate a new problem statement base on the answer. Then ask “why” again, and again. Repeat this process a number of times until the essence of the “real” problem emerges. Initial statement: How can we market our in-house multimedia products? Why? : Because many of our internal customers are out sourcing their multimedia projects. Restatement: How can we keep internal customers from outsourcing their multimedia projects? Why? : Because it should be our mandate to do all of the organization’s multimedia? Restatement: How can we establish a mandate to do all of the organizations multimedia? Why? : Because we need to broaden our customer base? Restatement: How can we broaden our customer base? Why? : Because we need a larger base in order to be cost effective? Restatement: How can we become more cost effective? Why? : Because our profit margin is diminishing? Restatement: How can we increase our profit margin? has emerged: How to obtain a mandate to do all of the organization’s multimedia projects. In their book Strategies For Creative Problem Solving, the following are what authors H. Scott Fogler and Steven E. LeBlanc call “problem statement triggers” These are how they restate problems. They use a breakfast cereal for each of their examples. The Toasty O’s cereal is clearly not getting to market fast enough to maintain freshness. Try placing emphasis on different words and phrases. Cereal is not getting to market fast enough to maintain freshness. Choose a term that has an explicit definition and substitute the explicit definition in each place that the term appears. Breakfast food that comes in a box is not getting to the place where it is sold fast enough to keep it from getting stale. Make an opposite statement, changing positives to negatives, and vice versa. How can we find a way to get the cereal to market so slowly that it will never be fresh? Change “every” to “some,” “always” to “sometimes,” “sometimes to “never,” and vice versa. Cereal is not getting to market fast enough to always maintain freshness. Replace “persuasive words” in the problem statement such as “obviously,” “clearly,” and “certainly” with the argument it is supposed to be replacing. The word clearly in the problem statement implies that if we could speed up delivery, freshness would be maintained. Maybe not! Maybe the store holds the cereal too long. Maybe the cereal is stale before it reaches the store. Express words in the form of an equation or picture, and visa-versa. Try out one or more of these techniques. Problem restatement helps you focus on the core of the problem. Identifying the core saves immense time, effort, and money. As a bonus, sometimes restating a problem points you directly to a solution. However, it shows there is more than one problem and helps identify them. 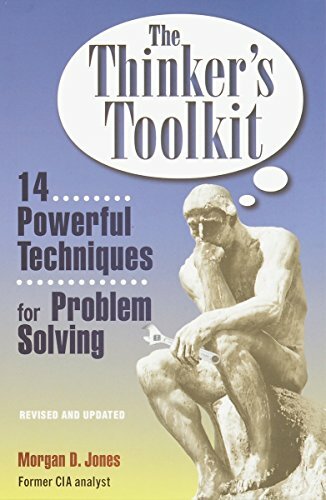 The Thinker’s Toolkit: 14 Powerful Techniques for Problem Solving by Morgan D. Jones.